Clean the salmon fillet (skin off). Combine salt, sugar and zest of lime, orange and tangerine. Coat the salmon with the mix and allow marinating in the fridge for 3 hours. Add the tea powder into the grissini dough. Shape the dough and bake it for 10 minutes at 190°C. Add Kaffir lime juice into the crème fraiche. To serve, take 1 cracker. 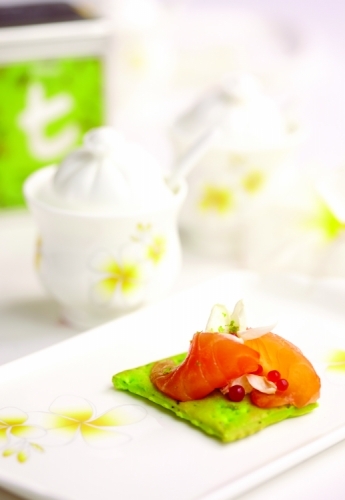 Place a slice of salmon gravlax on the cracker. Make a quenelle of crème fraiche and place on top of the salmon. Top it off with freshly grated zest of a Kaffir lime.